Just Another Day...: Potty Time... again! I guess it was inevitable. My baby. My sweet little baby E. He would eventually grow up, and it would no longer be acceptable for him to wear diapers. It seems we've reached such a time as this. 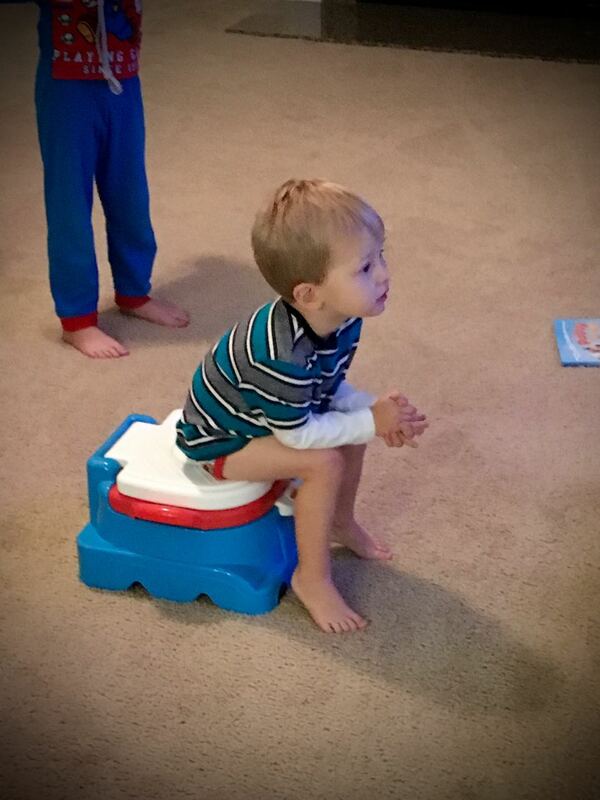 So Friday morning, I introduced him to his cool new Thomas potty and put him in his new Thomas underwear. He requested to watch (you guessed it!) Thomas on the MBP, and proceeded to make himself nice and comfy as we began. Assuming the position! Potty + TV = every person's dream come true. I continuously set the timer on my Apple Watch for 5 minutes throughout the day, and brought him over to the potty each time it went off. Now, this guy knows how to do this right! Thomas (or Chuck the Truck) on the MBP, a large spill-proof cup of chocolate milk, a bowl of Cheez-Its, and he's in business! 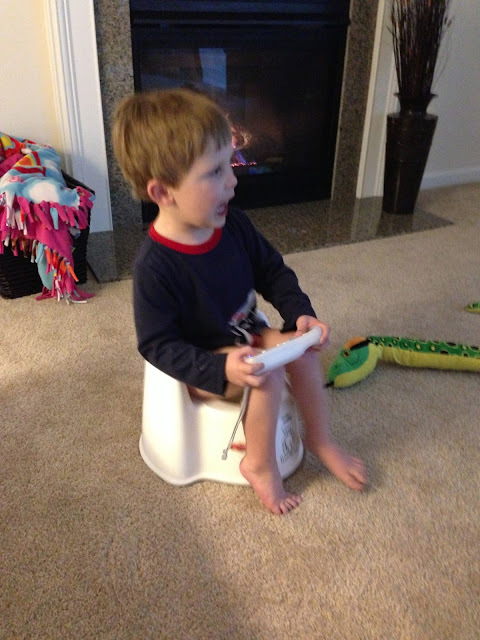 The kid literally seemed to spend more time ON his potty than OFF of it during the first few days. 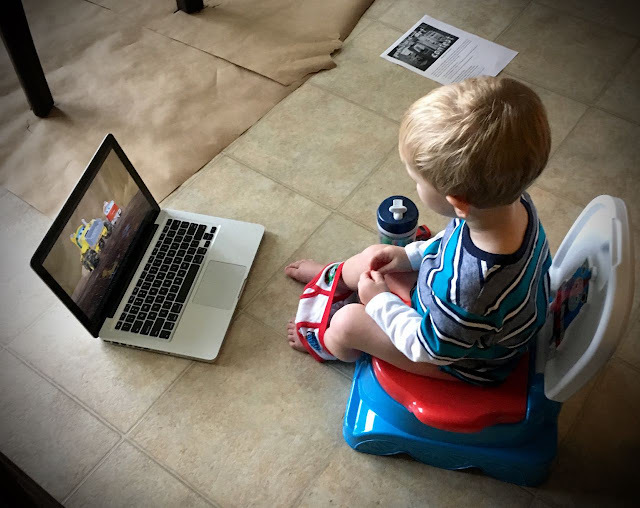 I think he was pretty happy with the setup and didn't see any need to change things up, except for the inconvenient times I that forced him to get up so I could go through the monotonous process of dumping the potty, washing his hands, and rewarding him with candy. 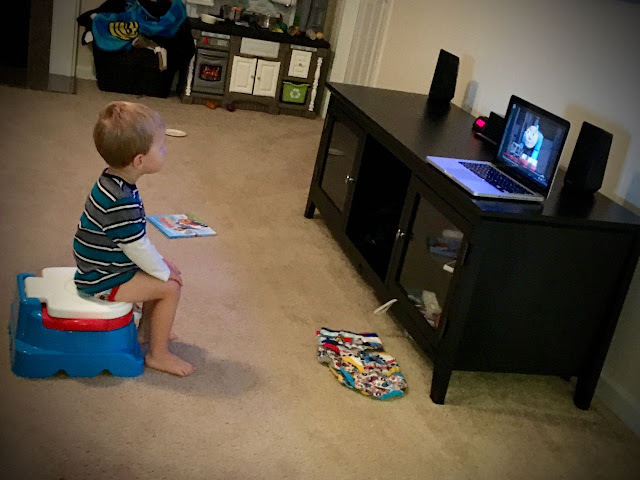 Surely before the next 5 minutes were up, he'd request to be back on the potty, snacks and shows at the ready! I wouldn't be surprised if these were minimum 30-minute increments on the potty. This process reminded me of a certain older brother of his who spent his potty training days sitting on the potty with a Wii remote in hand, playing Super Mario Bros. Wii or Dora the Explorer. See? Truly one of the best things about being the youngest has to be that you have older siblings who are always nearby to keep you entertained. In this case, it was a round of "roll the ball" that kept E's attention while chilling on the potty. 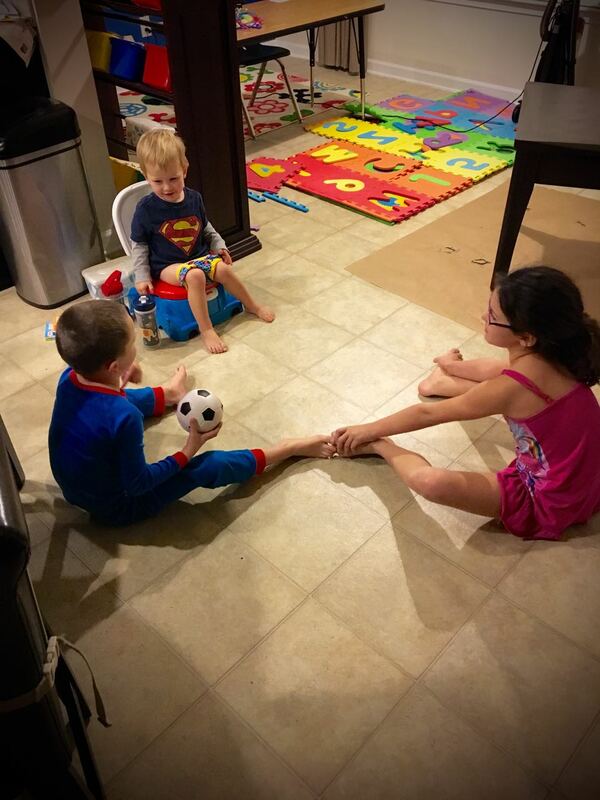 This process also reminded me of the potty training experience with both LO and Chase, so I dug up these little gems to share here of these two announcing their potty successes. Enjoy!